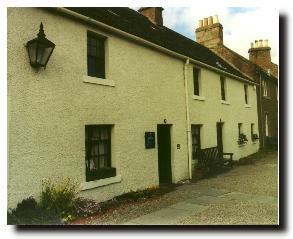 Born in Kirriemuir on 9 May 1860 in the house pictured here, James Mathew Barrie was the 9th child of a weaver. Even as a child, he wrote for the school magazine and drama group (in which he also acted). He took a Master of Arts degree at Edinburgh University and after a short spell with the Nottingham Journal he moved to London in 1885. Barrie wrote for a number of papers and published his first book in 1887 and subsequent stories established his reputation and popularity. "Auld Licht Idylls" was a series of racy sketches of humble life in Kirriemuir (renamed 'Thrums' in the book, after the word in weaving for the ends of the warp threads). These stories began what was to become known, somewhat disparagingly, as the "Kailyard School" of Scottish fiction. A number of novels followed including "The Little Minister" and "Margaret Ogilvy", the latter a tender tribute to his mother. But Barrie was now turning more to writing plays and even an opera (in collaboration with Sir Arthur Conan Doyle, no less). In 1897 a stage version of "The Little Minister" was a great popular success and he went on to create many of his well known works such as "The Admirable Crichton" in 1902. A story "The Little White Bird" published in 1902 had ideas which Barrie carried forward to his best known work "Peter Pan". This was first performed in 1904 and was followed by "Peter and Wendy" in 1911. Peter Pan is one of the great classics of the British stage which not only enthralls young people but holds the attention of adults too. Romantic and sentimental, the Peter Pan concept has been adapted in the latter half of the 20th century to innumerable pantomime versions over the festive season. Many of Barrie's later plays are not performed much now, though "Dear Brutus" published in 1917 and of course "The Admirable Crichton" do get an airing. Compared by some to Dickens and highly regarded, particularly during his lifetime, it is surprising that Barrie himself claimed that he might not have taken up writing if he had been taller! He was extremely concerned about his small stature (5 feet 1 inch) and seemed more comfortable in the company of children. He married an actress in 1894 but the marriage was dissolved in 1910. Barrie adopted the five orphaned sons of neighbours in Kensington London. He claimed that the character of Peter Pan was based on a composite picture of these five boys. One of the boys was killed in WW1 and another drowned in 1921, a tragedy from which Barrie never fully recovered. Barrie was knighted in 1913 and became Rector of St Andrews University in the same year (delivering a notable address on "courage" at his inauguration). In 1928 he succeeded Thomas Hardy as President of the Society of Authors. He died in 1937 but, unlike many other literary greats, he is not buried at Westminster Abbey. At his own request, he is buried in his native Kirriemuir. Royalties from Peter Pan have been awarded in perpetuity to Great Ormond Street Hospital for Sick Children in London. 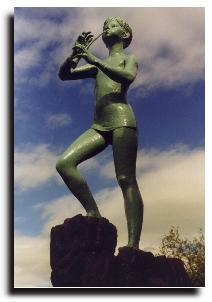 Barrie's birthplace in Kirriemuir is now in the care of the Scottish National Trust and nearby is a small adventure garden with reminders of Peter Pan, including a statue of the boy who never grew up. Also in Kirriemuir is a "camera obscura" (one of only three in Scotland) donated to his home town by J M Barrie. The camera obscura is located at the local cricket ground as Barrie was passionately interested in the game, but the camera also gives excellent views of the Angus glens. Barrie claimed that he played twice for the local cricket club - "The first time I scored one run, the second time I was not so lucky".